Article of the Week: Pure Gold: fighting for ethical jewellery - CounterCultural. CounterCouture. This week’s article is taking a break from my normal pattern of Look, Look, and more Look (even if I did write an article based around one of their suggestions yesterday). Instead I have been inspired by Inspire (hehehe, see what I did there), which is a Christian magazine that my church gives out for free. The last issue contained a story on the fashion industry’s impact in Bangladesh and other countries after the collapse of a clothing factory. It stirred my heart but, I hate to admit, not enough to move me to change my clothing habits. If you’re like me, it takes a lot to move me away from the high street completely. However, the issue I received on Sunday has done the exact opposite. A self-confessed jewellery magpie, I love anything that is shiny and bright. I love it even more if I can hang it round my neck or from my ears… but I never considered where the silver and gold actually came from. That was until I read the big interview in Inspire. Who knew that there was such a thing as fairtrade and fairmined gold?! Reading through the interview with Greg Valerio, I have found myself inspired to rethink my approach to the necklaces and earrings I so adore. 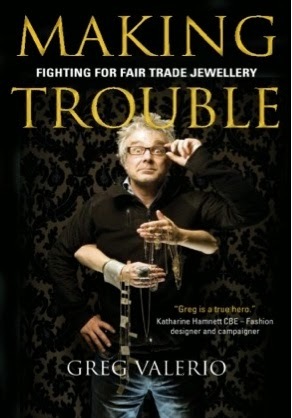 The founder of CRED, an ethical jewellery business, Greg Valerio quoted Revelation 21:15-21 as his inspiration behind the idea. I can’t begin to put into words what it is that drives him so I shall use his own words. “In Revelation 21:15-21 in the vision of the new Jerusalem, the gold is as ‘transparent as glass’. This must refer to its essential properties because gold is not transparent. This is the drive behind Greg’s involvement with the Fairtrade gold project. His passion for it comes through the article and is catching! After reading this article just before the service started (once I saw the title I couldn’t think of anything else), I proceeded to tell my mum all about it once I got home (talk about the gift of patience). Out of the resulting babble, I made a decision. That decision was to not buy jewellery from non-Fairtrade sources (with the exceptions of charity shops as they sort of redeems the source). It will be difficult as I love my jewels but it’s something I really want to do. It’s a small change but hopefully one that will help a few lives. Am I crazy to give up high street gems? Probably! Am I passionate enough to keep it up? I hope so!